Safety is always the priority when it comes to driving cars. And one can never feel safe without a helmet to protect your head every time you go for a spin. Helmets are even more important if you want to take your car to a track and just go crazy with it. With a reliable helmet on your head, you can push your car as hard as you can without having to worry about your safety. 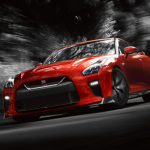 So as a treat, we have listed the best car helmets at each price point right now. We really recommend that you get one of these helmets before you go on to a circuit. These helmets offer the best protection and therefore, a great value for your money! 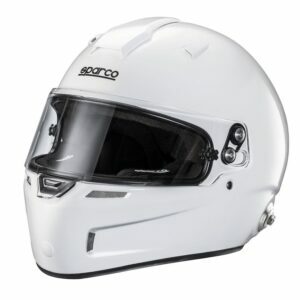 The Sparco Club X1 helmet features an Advanced Thermo Material (ATM) shell for enhanced safety and is ideal for events that do not require fireproof helmets to be worn such as track days and clubman events. The helmet features several air vents on the chin, forehead, and top of the head to provide a good level of cooling. 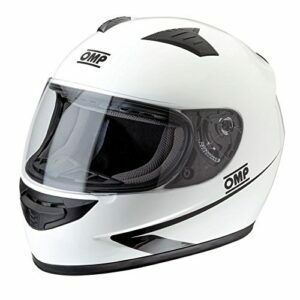 The Circuit from OMP is an entry level full face helmet with an ABS shell wide visor aperture for good vision, a clear visor and velvet lining. Air vents on the chin and crown provide excellent airflow and ventilation. Note: The Circuit helmet has no approval for motorsport use but is ideal for track days*, karting (non-MSA / FIA) or other non-MSA / FIA events. 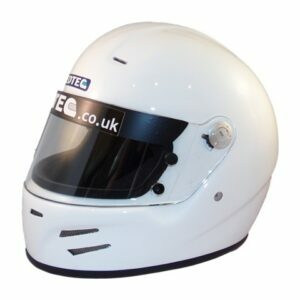 The Hedtec full face Snell SA2010 approved as used by thousands of drivers worldwide and the official helmet for Silverstone driving experiences. It is not an FHR (HANS) helmet but is used in many forms of motorsport where these devices are not mandatory such as Karting. Race Safety Accessories called upon one of the largest and most renowned motorsport helmet producers in the world when creating the Pro full face helmet. 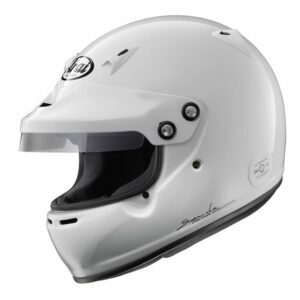 The result is a motorsport helmet which meets Snell SA2015 approval at an entry-level price. The helmet is fully HANS compatible and is drilled and tapped (M6) ready to accept HANS posts (sold separately). The shell has a lightweight composite construction and the fire retardant liner is removable to facilitate washing. 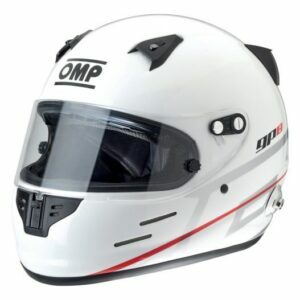 The OMP GP8 helmet is constructed from a composite shell for strength and lightweight as well as an ergonomic & highly breathable lining internally. 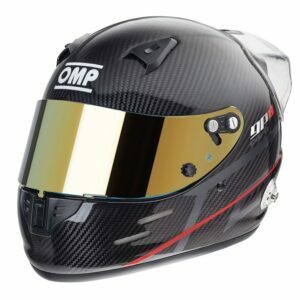 Featuring an exceptional ventilation system, the OMP GP8 ensures cool air is constantly supplied to the wearer through the stylish vents on the chin, top, and rear of the helmet. A unique locking system is incorporated onto the chin so that the visor remains securely in place at all times. Supplied with a standard clear visor and smoked touring visor, the GP8 is ideal for situations in either open or closed cockpits. Also featuring a double D-Ring closure, the GP8 from OMP ensures a secure fit for any wearer. 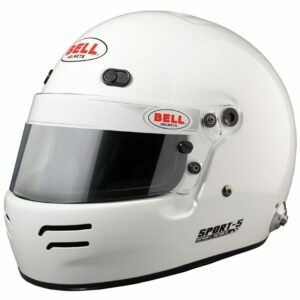 The Bell Sport 5 is the latest version of the best selling, classic design full face helmet offered at an entry-level price. 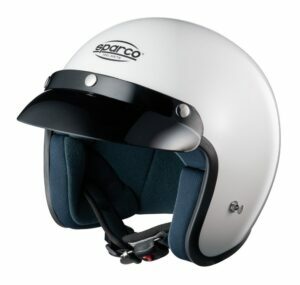 Constructed to the usual highest Bell standards, the Sport 5 can be used in many forms of motorsport and is versatile enough to be used in closed cockpit applications as the visor can be removed and replaced with a sun peak available separately. 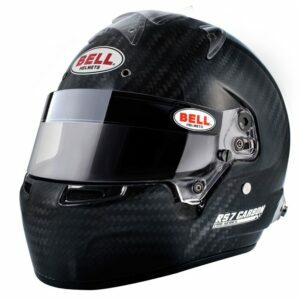 The Mag 9 Pro from Bell is a motorsport open face helmet manufactured from a high-tech carbon/kevlar/glass tri-weave shell. An adjustable sun peak with anti-dazzle strip help keeps the sun out of your eyes. The comfortable, flame retardant liner features removable ear cushions to facilitate the fitting of an intercom headset (not included). 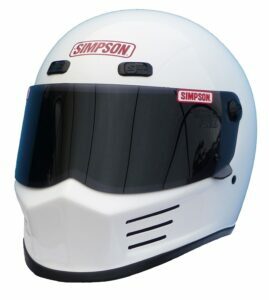 This is a great all-round helmet from Simpson that not only looks great but allows the wearer to remain cool and comfortable whether you are making a quick ride through town or traveling down the freeway. Taking over the reins from its predecessor, the WTX-5, the Sparco Air Pro RF-5w features an all-new design for the 2017 season. With a strong fiberglass shell, this helmet provides superior levels of comfort and safety for an affordable price. Inside the helmet, the EPS padding and linings can be removed for washing as well as allowing for repositioning for further levels of comfort and personalization. The helmet features a high level of ventilation with grilles on the front chin bar and six ducts on the top and back of the helmet. There is also the facility to accommodate a drinks system. The visor features a center positioned locking tab and can be continually adjusted. 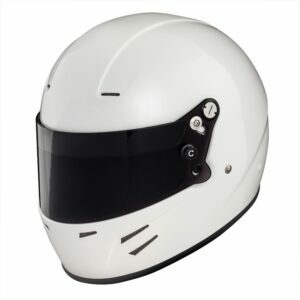 The helmet is available in two different shell sizes and now features a Medium-Large size to provide an extra option in order to obtain the perfect fit. 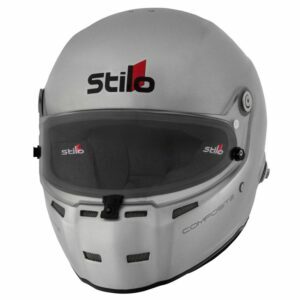 The Stilo ST5 range of helmets has been developed after meticulous and inexhaustible research for perfection. Pushing the standards of safety and quality even further, the Stilo ST5 is now the benchmark for all competitors. The GP8 Carbon is a full face helmet manufactured using an ultra-lightweight carbon fiber shell. The inside is made from a very soft and comfortable fire-retardant breathable Nomex® material. The GP 8 Carbon helmet also features an extremely good ventilation system allowing the driver the best airflow available. Vents are positioned on the chin, brow, and rear of the helmet. These also have an open and close feature aiding the airflow management. The visor mechanism is extremely precise and also incorporates a unique locking system on the chin. 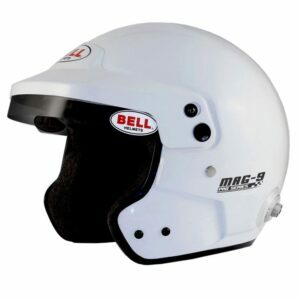 The helmet also features a double D-Ring closure for a secure fit along with a gold Iridium visor fitted as standard. Fitted with factory installed FHR posts. The Arai GP-5W Helmet is a full face helmet with a super complex laminate shell construction designed to be both strong and lightweight. 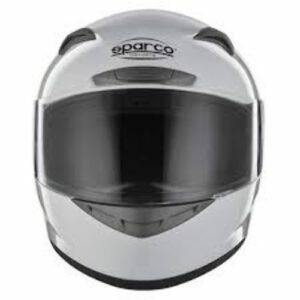 Ideal for closed cockpit racing as the visor aperture is wider than other Arai helmets, but can also be retrofitted with a full visor for use in open cockpit racing (purchase replacement visor and fitting kit from accessories). Sharing the same design as the top of the range HP7 helmet, the RS7 Carbon features a lightweight shell made from carbon fiber and is fitted with an optical grade double screen anti-fog visor for excellent visibility. The way the visor fits into the shell has been designed to reduce noise and improve aerodynamics.